WAKEFIELD — Hundreds of people rallied Monday evening to protest the controversial police shooting death of unarmed teen Ramarley Graham in his Bronx home — shouting "murderers" at a cop car that drove by. Residents were mourning the death of the 18-year-old Graham and also protesting the circumstances surrounding last Thursday's shooting. They believed the police were being overly aggressive when they chased and shot the teen. "My son never did anything wrong and they dragged his name through the mud," said the victim's father, Frank Graham, speaking through a bullhorn to the crowd in front of his home. Other friends and family lit candles at a memorial in front of Graham's home. "He was just a good boy," Graham's godsister Makeba Johnson, 25, said after kneeling in front of a picture of the teen, tears streaming down her face. "He didn't deserve to die like that. I hope the person who did this goes to jail." Graham had been pursued from White Plains Road and East 228th Street to his home at 749 E. 229th St. by police, who were investigating a report of a drug deal at 3 p.m. last Thursday. The officers believed they saw a gun in Graham's waistband and broke through the door of the building, chasing him into the bathroom where they shot him in the chest. The cops can be seen kicking the door in surveillance footage obtained by NY1. Police did not find a weapon, though they did find one bag of marijuana. 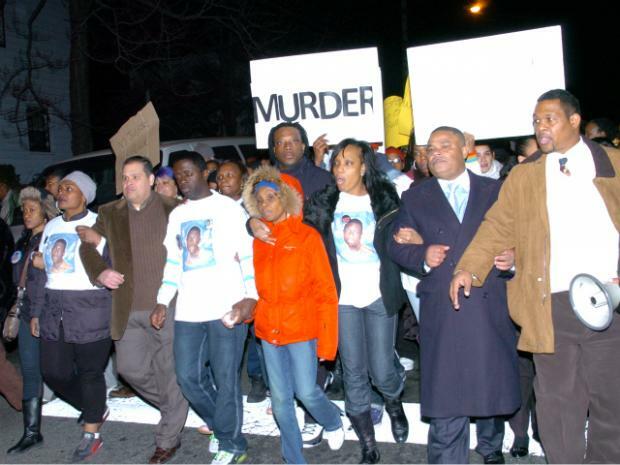 After speaking in front of their home, Graham's family led supporters on a march to the 47th Precinct about 6 p.m. The officer who shot Graham, along with his supervisor, were stripped of their guns and placed on desk duty, Police Commissioner Raymond Kelly had said.